Osprey Atmos vs Aether: Which is better? Osprey backpacks need no introduction. One of the best hiking backpack brands around, Osprey has plenty of options to suit every budget. And from simple to sophisticated, they’re all super high quality design and manufacture. The Osprey Atmos and Osprey Aether are both very popular backpacks – and for good reason. You really can’t go wrong with either, but there are a few key differences you should consider before making a purchase (more on those below). With that said, our favourite has to be the Atmos. It's bigger and lighter, and even if you don't intend to use it to full capacity, it compresses down nicely for smaller loads. We also feel it's more comfortable than the Aether, with the anti-gravity suspension and hip straps really taking the strain off of your back and shoulders. It's also more easily adjustable to fit your frame. However, the Aether does have a few extra features which have their advantages, such as with the extra straps and buckles that come in handy for carrying poles and tools. It also has a belt on the top lid, which means it can double up as a waist pack for weekend excursions. Check out the rest of this buying guide for a more detailed breakdown of these differences, why the Aether will be a better option for some backpackers, and a third option which may just throw a spanner in the works, as it were. Want more options? Check out our best hiking backpacks buying guide. One of the things that sets these two backpacks apart from one another is that the Osprey Atmos weighs a bit less than the Osprey Aether. Now, the difference is not huge, but it is a difference none the less. The Atmos weighs under 4 pounds, while the Aether weighs just a little over 5 pounds. A 1-pound difference might not seem like much, but when you are walking around for hours or days, a single pound can make a big difference to your back and legs. We think the Osprey Atmos does not have as good rain and wind protection as the Osprey Aether. While both are fairly durable and well built, the Aether comes with a really nice wind and rain cover that will keep all of the contents on the inside safe. Both of these backpacks are made with durable, wind resistant, and water-resistant nylon materials, but the Aether comes with a bit of added protection, something that we appreciate. You might not consider this to be an extremely important point when it comes to a hiking and camping backpack, but we surely do. The Osprey Atmos has an internal hydration sleeve, which means that it can hold a water, so you don’t go thirsty while hiking around. This is a cool feature no doubt. However, the Osprey Aether actually comes with dual hydration sleeves, one on the inside and one on the outside. If becoming dehydrated and replenishing fluids is a concern when hiking, the Aether is probably the better option to go with. There is no denying that both of these backpacks come with quite a bit of storage space. In terms of hiking and backpacking, both are good options, and both have ample room for all of your gear. However, when it comes down to it, the Osprey Atmos does have a little more storage space than the Aether, which is true both internally and externally. Simply put, the Atmos has more interior room for storage than the Aether. At the same time, the Atmos also has a larger number of exterior pockets of differing styles than the Aether does. Storage is important when it comes to hiking backpacks, so the Atmos is the winner here. This might seem like another odd point of comparison; however, compression is actually quite important. Both these backpacks feature compression features, so you can cut down on the size of the packs on your back. However, from what we have discovered, the Aether is a little better here. It allows for increased and more precise compression compared to the Atmos, which helps cut down on size. The Aether even comes with a removable day pack so you have a mini backpack ready to go. ​Osprey Atmos vs Aether - How Do They Compare? 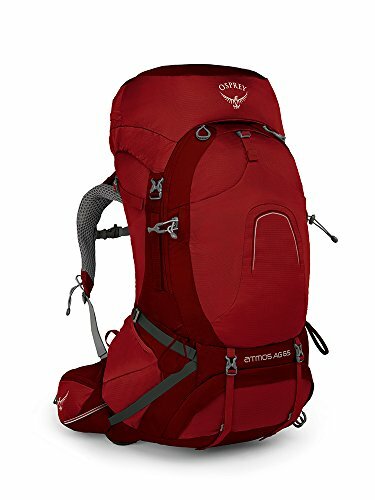 ​​Another similar – and popular - hiking backpack in weight and size is the Gregory Mountain Products Baltoro Hiking Backpack (​link to Amazon). However, the Aether and the Atmos are both quite different from this particular backpack. We think they’re more durable than the Baltoro. They also have more storage space, both internally and externally. The Baltoro also doesn’t come with a water sleeve. However, on the other hand, we do think that it’s made to be a little more comfortable and easier to carry around, especially when it comes to ventilation and lumbar support. ​​OK, so to recap, if your main point of concern with a hiking backpack is storage space, we would recommend going with the Atmos (​link to Amazon)​. It has more room internally, plus it has more external pockets too. At the same time, the Atmos is actually a bit lighter and easier to carry. On the other hand, the Aether​ (​link to Amazon) is a little more durable, it is better equipped to deal with rain, and is slightly better in terms of compression.